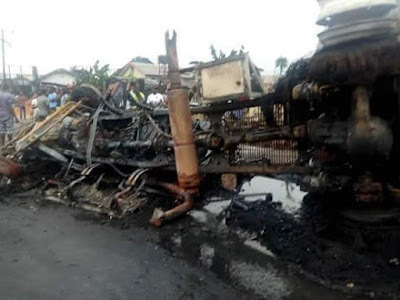 The Rivers state Police command has launched investigations into the Thursday, August 30 tanker fire that destroyed properti worth billions. The police said it has launched a manhunt for the driver of ill-fated tanker so as to carry out a thorough investigation into the inferno that razed down shops, church and hotel on Thursday morning. VIEWS MEDIA reported The Petrol Tanker Explosion fire which began after the tanker missed its track and hit an electric pole. Sparks from the electric wire started the fire, eyewitnesses told our correspondent. Although no casualties were reported, the driver of the diesel-laden tanker has not yet been identified with locals stating that he might have disappeared after seeing the level of damage the fire caused. But the police in a statement said that they will leave no stone unturned to unravel the mysteries behind the tanker fire.